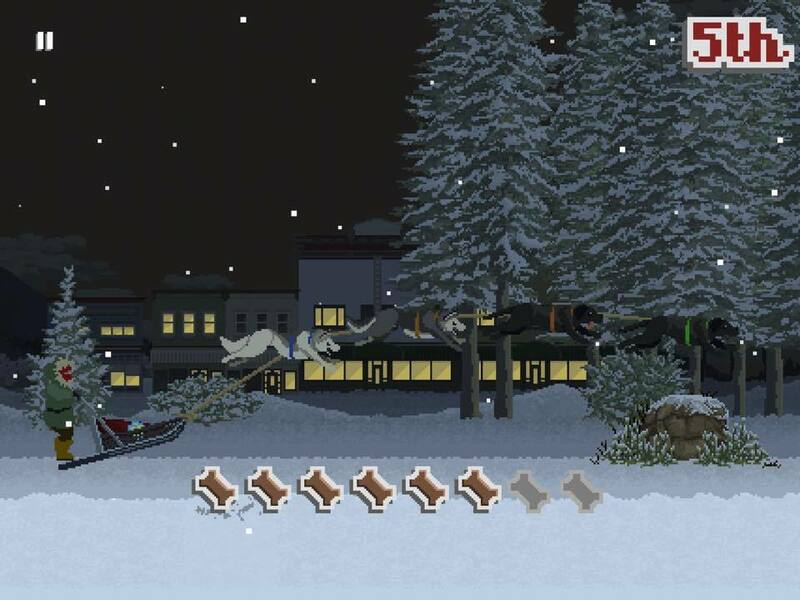 Pleasant is the operative word to describe Dan Fitzgerald and Lisa Bromiel’s Dog Sled Saga ($3.99), a charming game about dog sled racing that is more of a simulator than a racer. It came out last fall, but I couldn’t let us get through the winter without giving it a proper look over. Especially since the current build is so much more polished and stable than launch. It’s definitely the strongest game the developers have released thus far and it only makes me look forward to what they comes out with next. So strap your boots on and clean out the kennel. It’s time to crack the whip! Or is it? Actually, this world is much nicer to its “big ole puppers” and “lil’ doggos.” Speed and energy are conferred via doggy treats that you have to throw accurately enough for the dogs to catch, because they’re very well trained and won’t stop for food. You have a limited number of these Scooby Snacks, but the courses are all littered with treat supply drops hanging on posts for you to grab as you fly by. I know what you’re thinking. 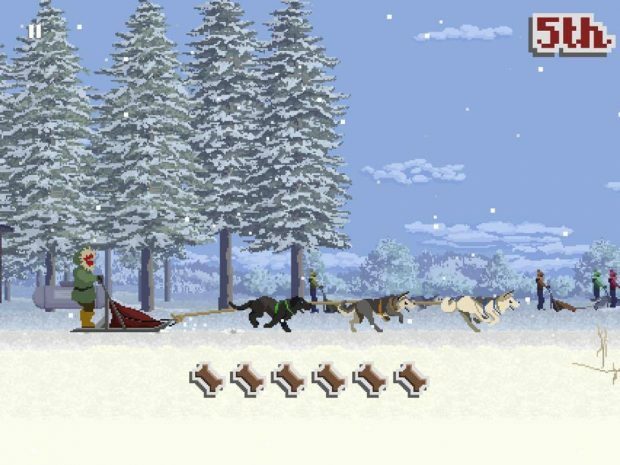 This all seems a little unrealistic for a supposed ‘simulator.’ Now, my expertise in dog sled racing come from the movies Snow Dogs and Eight Below. Also, I barely remember anything about either film. Which is to say that I have zero expertise. So I’ll allow it! It’s all much lovelier this way and will probably help appease the PETA minded people. At least a little. As a young newcomer to the dog sled scene you’ll learn a lot as you race, manage funds, and keep the dogs happy and healthy. Assuming you’re not some kind of monster. But how could you not want what’s best for these dogs? They’re just so cute. 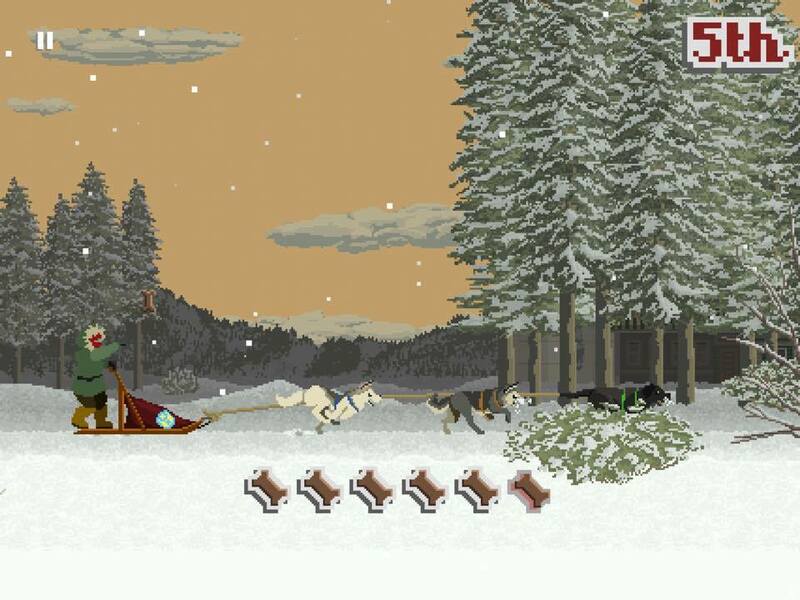 Lisa Bromiel’s pixel art in Dog Sled Saga is fantastic. The landscapes and backgrounds convey a sense of majesty, with loads of detail in the environment and animals alike. This is especially true for the profile shots of each dog as you shop around for team mates. Don’t forget that you can actually pet every dog in the kennel via swiping. Don’t go neglecting them now. Races themselves are less about passing other races on a course, though you do see this happen in the background, and more about feeding dogs at the optimal times while avoiding obstacles and making sure you don’t run out of treats. Some maps have a very limited number of treats, so your throws really matter. Dogs can get caught up in their harnesses and will slow down if you fail to feed them for too long, which will really hit their stamina in between races. And it’s what you do in-between races that matters even more than the races themselves. After a race, you’ll see how much energy your dog has spent. There are two levels to this, where a first level unit of tiredness takes one rest to go away, but a second level takes an entire cycle of four. You have to be very careful not to overwork your dogs. Back in the kennel, each day that you don’t race, you can pamper and rest them, train them, or just leave them be. They’ll still recover somewhat in the idle option. You can only handle so many dogs at one time, so eventually you’ll need to hire an employee or two to help you. As you progress, better trainers with bonuses to their training and resting speeds will show up, at a higher monthly cost of course. And therein lies the real strategy of the game. Managing your time and your budget from month to month. But it’s not nearly so tedious as in real life. Many things make up your monthly expenses, from the aforementioned employees to simple feeding and housing costs, and also league dues that allow you to take part in the races that you do. You’ll have to buy your way into each league and earn your spot with a qualifying race. The higher the league, the better the prizes too. The game is nice enough to outline all of these things on simple budget sheets. 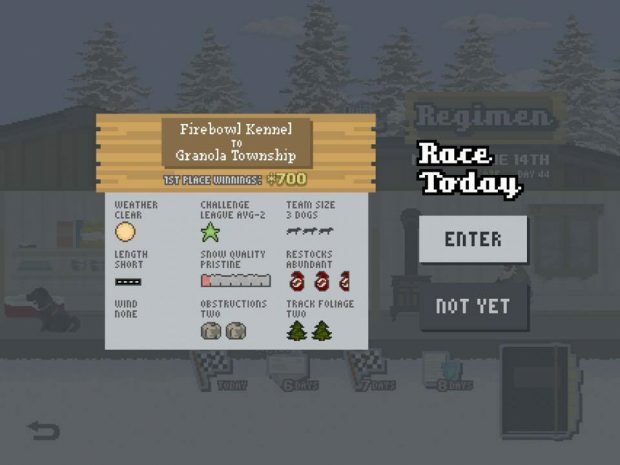 Once you get to league 6 out of 7 and start having 5 dog races is where the challenge really starts. On the other hand, this is also where the game starts to slow down. Once you add newer, less experienced dogs to your roster to keep up with minimum requirements, they’ll hold you back a lot at first. 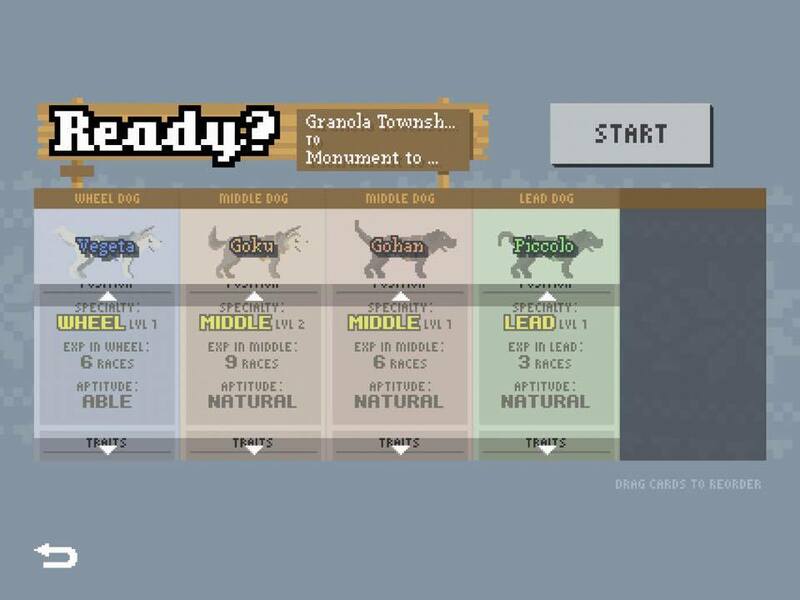 This is where you really notice the progress of your starting dogs. The new ones will need to be fed much more often and make mistakes more often. You will have to train them up to keep things balanced. Luckily, taking part in high level races, they get experience very quickly, but also tire very quickly and will need more down time. Beyond increasing the endurance of your dogs, you can also increase their fame. Every time you nail a tricky treat throw like a mid-air catch or time it so multiple dogs catch treats at the exact same time, a camera flash will go off and they’ll get fame points. There is a lot more to the game. Sponsorships become more and more available, covering some of your monthly expenses or giving you a bigger food bag or a better sled. In addition to being best at a certain position, either as lead, middle, or wheel, dogs also have certain traits and skills and faults, which you won’t know about until you randomly discover them in the process of racing. Some dogs do better with consecutive perfect catches. Some get excited and speed up when you pass another racer in the background. Some just prefer night to day. There are faults which mostly randomly trigger. Like a dog being insatiably hungry for a while, or randomly dropping speed for no real reason. You’ll also get a couple stories. A current story about a rival “jerk” of a racer as well as the heroic tales of a historic dog named Aurora. These are interesting at first but the interest definitely dropped off for me as I played. That said, the story isn’t really the drive. It’s just kind of there. This is a game to play if you want something easy-going and relaxing. Not that it doesn’t have some frantic race moments. More races go smoothly than don’t, and it’s a matter of learning the ins and outs of each dog’s personality and skills, where to best place them, etc. You can even breed new puppies using your existing dogs, though I haven’t seen quite how deep this mechanic goes. All in all, it’s like I said at the start. This game is just pleasant to play, with a nice tone and gorgeous pixel art visuals. Dog Sled Saga isn’t for everyone, but I’m very glad I played it. Next PostNext There’s Now a Gamevice for iPad Pro 12.9, What Will Science Come up With Next? !